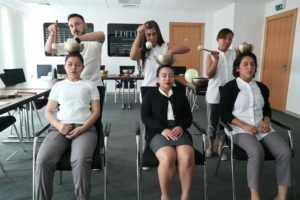 The training took place at The Abu Dhabi EDITION, an Ian Schrager hotel (which falls under Marriott), the therapists come from Mexico, Italy, Myanmar, Indonesia and Philippines. 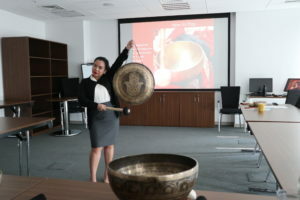 We had a full 3 days of training in the History of Sound Therapy, using ancient wisdom along with scientific side by educating the therapists on Cymatics and brain entrainment. 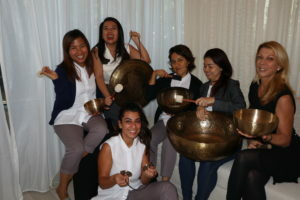 We covered localized healing as well as a full body protocol and how to conduct a group sound meditation session. 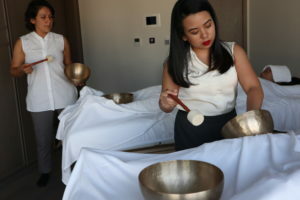 This is the first luxury hotel spa in the United Arab Emirates offering this treatment and so far is getting excellent feedback. The locals are curious and adding it to their massages! Songwriter and recording artist Monte Selby has written over 200 published songs. His songs are heard on network television, radio, stage productions, YouTube, and included on the 2012 Grammy Award winning Best Children’s Album. Music Row magazine describes his songs as “a delightful variety” – “funky” – “astonishing” – “Wow”! Selby’s performances include over one thousand venues across North America, Europe and Asia, where he shares the stories and music from writing with over 40,000 students and adults. A former award-winning teacher, principal and professor, Selby uses his background in education to write books, offer inspiring presentations at conferences, and provide professional development to educators. Did you ever wonder what kids or parents or grandparents would want to say if they could write with a professional songwriter? People experiencing success or trauma or love or new insight often have a story to tell! Songwriter Monte Selby tries to capture those stories, and here are examples of songs he’s written from people in schools, residential treatment facilities, senior citizen events, and correctional institutions. This is about the power of music/songwriting to help people heal. This small group of high school girls (in a treatment center), decided the most important thing is to realize that you have to choose to get better because YOU want to get better for YOU. Written with kids in Iowa. Written with kids in Montana – a one room school with only a few kids in k-6th grade. This one is just in case you know a 2nd grader. This is a song from the “senior citizen” project.